As the Obama White House and its NATO allies discuss their responses to Russia’s activities in Ukraine, Washington faces its own internal divisions, some of which are being reflected in the early stages of the 2016 presidential campaign. Republicans and Democrats in the United States are strongly divided on the situation in Ukraine and what to do about it. Members of both American political parties see Russia as a major military threat to neighboring countries, but to differing degrees, according to our latest survey. Two-thirds of GOP members see Russia as a military threat, but only 56% of Democrats share their fear. And while half of Republicans say Russia is to blame for the violence in eastern Ukraine, just 39% of Democrats agree. There is a similar partisan divide over what to do about the situation in Ukraine. Republicans are far more likely than Democrats to support military assistance. 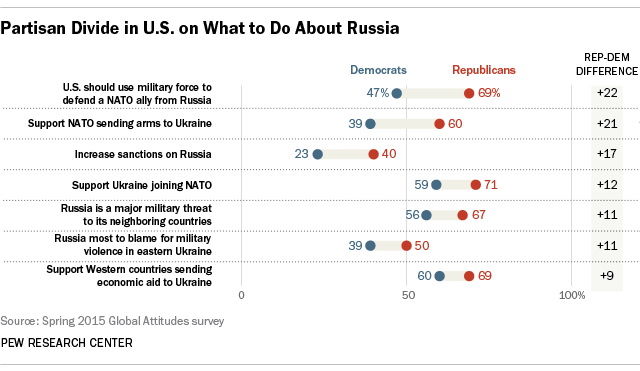 Six-in-ten Republicans voice support for NATO sending arms to the Ukrainian government compared with 39% of Democrats. The smallest partisan division is over economic aid to Kyiv: 69% of Republicans back such assistance, as do 60% of Democrats. Substantial percentages of both parties favor keeping U.S. and EU economic sanctions against Russia about the same: 44% of Republicans and 54% of Democrats. However, 40% of Republicans would increase those sanctions, while only 23% of Democrats approve of such action. Members of both parties support NATO membership for Ukraine. Such support is greater among members of the GOP (71%) than among Democrats (59%). Moreover, there is a partisan difference about U.S. obligations to come to the military assistance of other NATO members. Nearly seven-in-ten Republicans (69%) say that Washington should come to the aid of its allies in the event of Russian aggression. But only 47% of Democrats back that long-standing U.S. treaty obligation, while 48% oppose it.